Floor Standing Oil-Rubbed Bronze/White Leather Griffith Astro Telescope 64"
Floor Standing Admirals Antique Brass Binoculars 62"
Floor Standing Brushed Nickel With Leather Griffith Astro Telescope 50"
Floor Standing Antique Copper Harbor Master Telescope 60"
Floor Standing Oil-Rubbed Bronze-White Leather With Black Stand Harbor Master Telescope 50"
Antique Copper Spyglass Keychain 6"
The Hampton Nautical Standing Antique Copper with White Leather Harbor Master Telescope 30” is a true nautical gem that is both fully functional and beautifully decorative, adding a warm seafaring shine to any room it graces. The stand has an adjustable knob to change and hold a specific direction. 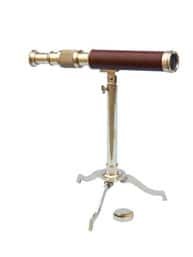 Focusing is accomplished by adjusting the eyepiece ring on the telescope tube, with up to 15x magnification, and a antique copper cap is included to protect the lens when not in use. The wooden tripod stand features smooth, polished round legs, each with antique copper fittings and a screw release to let you adjust the height. 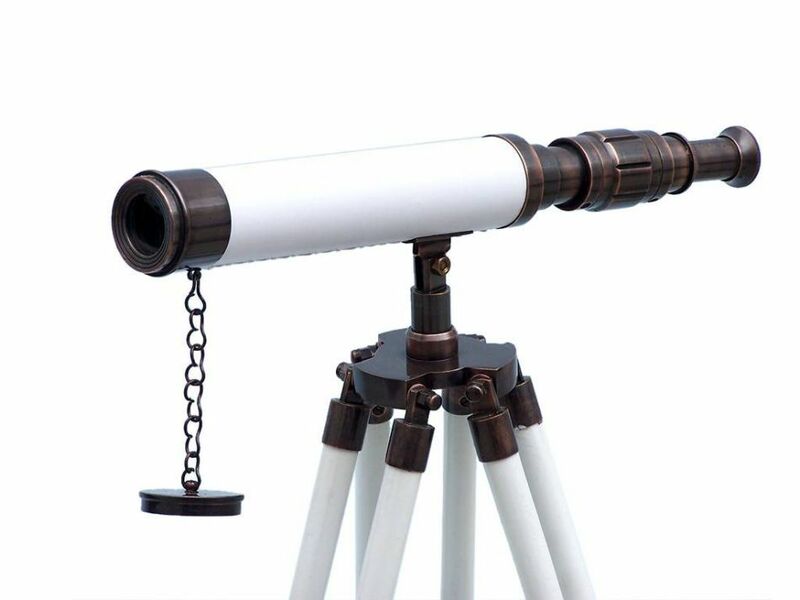 A antique copper chain holds the three wooden legs together so the telescope can maintain its position.